On October 12th (this Friday), MattyCollector is celebrating 30 years of Masters of the Universe. 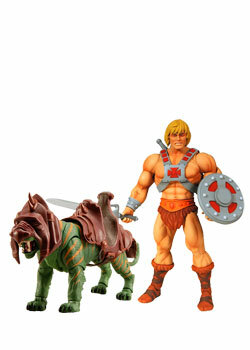 For fans, this means a great deal on the He-Man Party Pack that includes both He-Man and Battle Cat. Check out the details below. The Deal: Pay just $30 for BOTH He-Man® and Battle Cat®! 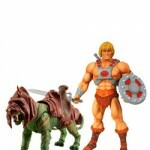 Only $30 for both He-Man® and his trusty ride Battle Cat®? That’s a deal that would make even grumpy old Skeletor® grin. At this special price, you’ll want to buy more than one pak – they make a great gift for new collectors and the holidays are right around the corner. But it’s only available for one day and one day only, so be there when the Shop opens on October 12th at 12:01am ET*! *While supplies last. Items are individually packaged and ship together in a single box. Shipping and taxes not included. That is a hell of a deal, even to a casual collector and fan. I am defiantly going to be picking these bad boys up! How could I resist that kind of a deal? and I bought battlecat a couple of months ago. I wonder if it'll be both characters sepperate or a extra big mailer for the two combined? It's 3:30 am on the 12the, and they're still not up for sale. That seems to be how they roll. It's like they have a "web guy" and when he wakes up, eats his breakfast, . . .logs in to work from home (or actually arrives at work) and pushes a button, THEN you can get the deal. On the flip side, the sale won't end at midnight tonight I'd bet. Web guy will be asleep or out at a movie or something. He'll turn it off sometime Saturday morning. So at 3:30 Saturday morning the 13th, I'd bet it's still available. 6:53 and still coming soon. Good job Matty! I picked up 3 of them today! Did anyone else abuse the sale?